A review of Magruder’s Curiosity Cabinet by H. P. Wood. Post may contain affiliate links. 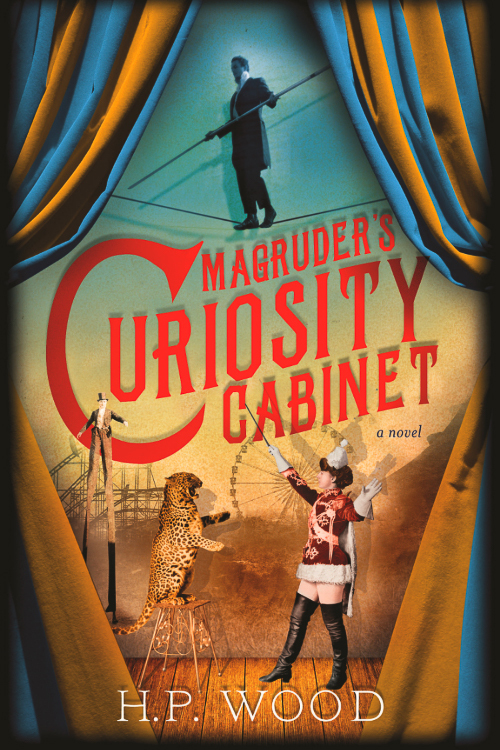 I had high hopes for Magruder’s Curiosity Cabinet and it did not disappoint, this book definitely goes on my top ten list for the year. The setting is turn of the century Coney Island, with all the sights and sounds that it has to offer. One of the places that it has to offer is Theopilus P. Magruder’s Curiosity Cabinet. The Cabinet is filled with all sorts of intriguing and mysterious things and people, the only problem is that it’s on the wrong end of Coney Island. Not many people venture down that far, which suits Zeph, a black man with no legs, who sort of manages the shop. He is more than happy just socializing with the people of Magruder’s, or the “Unusuals” as they call themselves. The are unusual and not to be confused with the “Dozens” – or the dime-a-dozen regular people. Kitty Hayward and her mother have arrived at Coney Island expecting to see all the sites. But when Kitty’s mother becomes ill and vanishes from their hotel, Kitty is kicked out on to the streets. Through a series of events, she ends up at Magruder’s. When people continue to become ill, the Unusuals find themselves struggling to protect their livelihood and the place that they call home. This is such a wonderful book. It is about friendship and seeing people for who they are, not what they look like. It is filled with humor, sadness, and charm. I received an ARC copy.